After rigorous testing, it is clear that Genetically Modified Organisms (GMOs) are safe for human and animal consumption. But should we use them? What are the risks of their use? What can we benefit from their use? Many argue that GMOs are too dangerous to use. Skeptics of GMOs claim that they will become invasive and overtake natural plant varieties and destroy biodiversity by breaking down complex food webs. However, GMOs can serve to protect the environment, produce high yields for a growing population, and sustain/develop economies through expanding and establishing new agricultural industries. The main argument against GMO use is that GMOs will spread and crowd out natural varieties of plants. One way that this is hypothesised is that the seeds of GMO plants will be unintentionally dispersed. These super seeds will be better adapted to fight off predators and will crowd out the indigenous plants. Their crowding will eliminate a tear of the local food chain and cause an ecological collapse in biodiversity. The second idea of ecological contamination is that pollen from the GMO plants will settle on their natural counterparts. This will transform the DNA of the seed and result in the plants offspring to be a hybrid. The presence of this hybrid could follow the path of the earlier scenario and also cause an ecological breakdown. These ideas can be seen by reports such as the Proposals for managing the coexistence of GM, conventional and organic crops by the Chartered Institute of Environmental Health. The use of GMO plants can have a profound effect on the state of the environment that we live in. One such example is the planting of a genetically modified strain of cotton, Bt cotton. In China, this GM variety of cotton has greatly reduced the amount of applied pesticides, “increasing the abundance of beneficial organisms on farms, and decrease[ing] populations of crop-damaging insects” (“The Truth”). Out in Arizona, farms growing this Bt variety are recorded as having a greater level of biodiversity present on the farms. Also, Arizona farmers growing Bt cotton are applying half the pesticides of the conventional cotton growing neighbors (“The Truth”). As of 8:13 PM on February 5, 2015, there were 7,293,014,628 people in the world. (Population Clock). GMOs may be the saving grace for a world that’s population is growing far beyond sustainability by traditional agriculture practices. As our population increases, we must look for new ways to feed our world. Therefore, we must do all we can to stop crop loss. In Tomorrow’s Table, Pamela Ronald illustrates the violence caused by just the loss of rice plants in Asia alone. According to Ronald, flash floods in South and Southeast Asia annihilate 15 million hectares of rice annually. To give you an idea of how much rice is lost, a hectare is 2.47 acres. 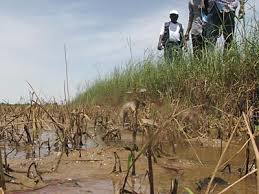 She also points out that in a land inhabited by 140 million people, these floods wash away $1 billion in rice crops annually. In Bangladesh and India, floods destroy 4 million tons of rice annually. That amount of rice could have fed 30 million people. By tacking the flood resistant gene from the FR13A rice plant to the swarna rice plant, the modified swarna plant can now withstand up to 14 days under submergence and still produce the high yields of the original swarna plant (Ronald, 2009, p.6). This new genetically engineered plant can replace the billions of dollars lost in crop damage due to floods and feed millions of previously starving people around the world. Another example of the possibilities of GMOs can be illustrated in the meat production industry. “In 2030, the world will likely consume 70 percent more meat than it did in 2000” (“GMOs”). As our consumption of meat continues to grow exponentially, we must concern ourselves with how do we produce higher meat yields? One emerging possibility is the idea of “in-vitro meats” or lab-grown meats (“GMOs”). This innovation will drastically cut back on our reliance on industrious livestock farming. According to the United Nations Food and Agriculture Organization, this independence from animals would eliminate about “20 percent of the earth’s greenhouse gas emission” (“GMOs”). Aside from feeding the world, GMOs can also strengthen or rebuild an economy. Nowhere is this more important than in developing countries. One case study is the banana industry in Uganda and East Africa. One-third of the world’s bananas are grown in sub-Saharan Africa. Within that region, those bananas account for more than 25 percent of the energy used by 100 million people. 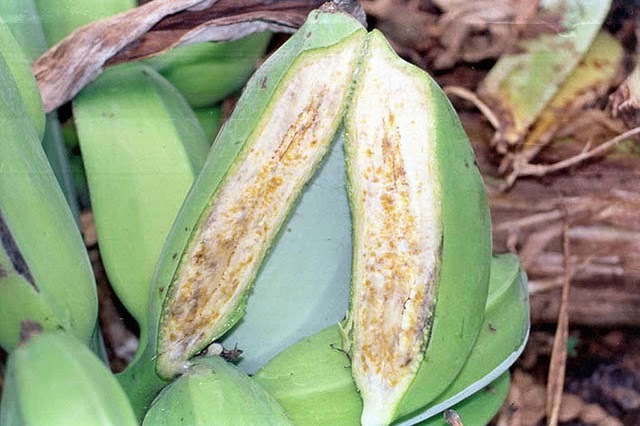 The Banana industry in Uganda and East Africa has all but been destroyed due to an infective bacteria that causes Banana Xanthomonas Wilt disease. Essentially the bacteria causes the banana to rot from the inside out. This infection turns the inside of the banana into a thick black ooze. “More than a thousand kinds of banana can be found worldwide, but none has robust resistance to BXW. Even if resistance were identified… breeding a new variety using conventional methods would take decades, assuming it is even possible” (“The Truth”). However, if a GMO resistant banana were grown, the banana industry would thrive once again. Professor Calestous Juma, a Harvard scholar who wrote “the most authoritative scholarly work [The New Harvest] on agriculture in Africa” (Kagolo), is of the opinion that the acceptance of GMOs “would only boost food and income security” (Kagolo). By engineering a resistant variety of banana tree, the tree can ward off the bacteria which would revitalize and secure the banana industry that is such a crucial sector in East Africa. The papaya industry in Hawaii and China is exists today only due to the innovations of genetic modification. In 1970, the ringspot virus was found in papayas in Hilo, Hawaii. This virus would eventually spread to all the papaya in Hawaii, essentially wiping out the industry. To combat the disease, Cornell University pathologist, Dennis Gonsalves, engineered the virus-resistant rainbow papaya plant. It is because of the virus-resistant rainbow papaya that the industry even exists today. In 2010, 30.1 million pounds of papayas were harvested in Hawaii (Callis). Today, 99 percent of Chinese and 70 percent of Hawaiian papaya farmers grow this variety (“The Truth”). In 2012, total papaya exports in US dollars accumulated to $8,637,162 (Callis). Genetically Modified Organisms are the future of the agriculture sector. Their implications are vital to helping preserve our environment, feed an ever increasing population, and to provide economic stability and growth to the various agricultural industries. GMOs should be fully embraced in public’s opinion as it is in the scientific community. It is vital to continue GMO research and practices. Without GMOs working for us, we are doomed to a toxic, hungry, and an economically unstable future. Callis, Tom. "Papaya: A GMO Success Story." Hawaii Tribune-Herald. N.p., 10 June 2013. Web. 04 Feb. 2015. <http://hawaiitribune-herald.com/sections/news/local-news/papaya-gmo-success-story.html>. Proposals for Managing the Coexistence of GM, Conventional and Organic Crops. N.p. : Chartered Institute of Environmental Health, Oct. 2006. PDF. Ronald, P. C., & Adamchak, R. W. (2008). Tomorrow’s Table. New York: Oxford University Press.